Fans of esports tournaments are more likely to be young and male, but this is a demographic which marketers have found increasingly difficult to engage, accordingto new research. The data, from Global Web Index, indicates that Esports success among males aged 16-24. China and South Korea have been indispensable in the development of esports, but there is a substantial opportunity in virtually all of the 40 markets GlobalWebIndex covers. Males aged 16-24 are around 2-3x (sometimes over 4x) as likely to be engaging with esports tournaments each month. There is also significant engagement in some mature markets – like the U.S., UK, and Sweden. These markets have considerable global economic influence as homes to some of the most important names in the gaming industry, and are poised to transform into regional esports hubs. 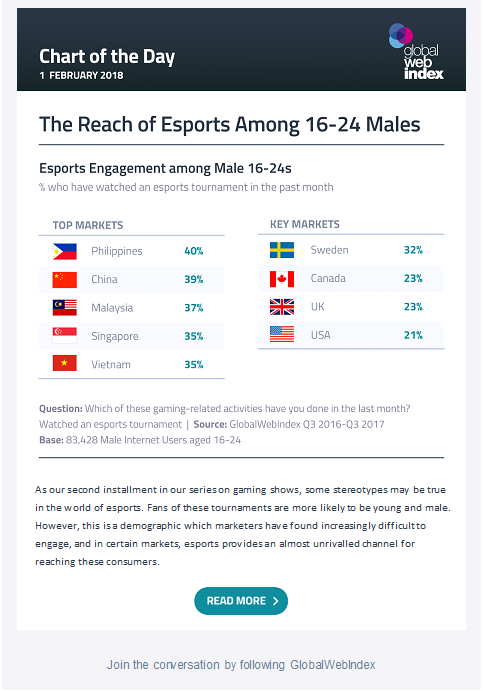 If we zero in on males 16-24s in the USA, then this audience group is actually more likely to be watching esports than any other sports online.